Preheat broiler. Arrange crackers on broiler pan. Mix sauce with zest and scallions. 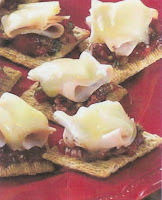 Dot crackers with sauce and top with folded turkey and Brie. Place under broiler to melt Brie, then serve warm. Makes 15 servings, two topped crackers each. Hi guys! Yum, that looks GOOD! I love the pictures of your kids and can't believe how BiG they have gotten. In my mind's eye, they are still the same way I saw them last, a lot younger! Love the pictures of Sydney at her ballet performance. She looks so tall and graceful :) It's been TOO long since we've gotten together, let's do it SOON! okay, if that's the picture from the way you made them, and not off the box, then i am TOTALLY in. (real life never turns out as good as the picture on the box). wow. those look really, REALLY good.